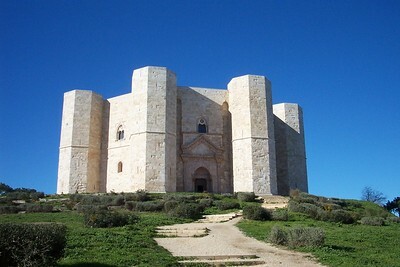 Castel del Monte is a unique masterpiece of medieval military architecture. Its form is perfect, its design a harmonious blend of cultural elements from Classical antiquity, Muslim architecture and the Cistercian Gothic of northern Europe. Sponsor of its construction was Emperor Frederick II von Hohenstaufen. He was a man of many talents: an absolute monarch but also a great lover of culture. He spoke several languages and was interested in mathematics, astronomy and natural sciences. His stay in the Middle East (for the Crusades) heavily influenced his thinking. The castle dates from 1240. After Frederick's death, it slowly fell into great disrepair. The mosaics and statues that have decorated the interior, were looted. The castle has been built on a hill, in the middle of nowhere. To find the road to nowhere was not so easy, the signposting is a bit scarce, but find it I did. You can see the castle from afar, towering above the endless number of olive trees in the quite lovely environment. The perfect octogonal shape of the building is its main asset. Among the many comparisons that can be made, the Taj Mahal also sprang to my mind. The special kind of limestone with quartz used here from a distance looks like marble (from which the Taj is made). And the Moghuls had some inspirations in common with Frederick. I also took a look inside, but there's not much to see anymore. It is hard to picture how people have lived here. From the many stories mystifying this castle, I didn't get the impression that it was used regularly. Probably it was "just" meant as a work of art. 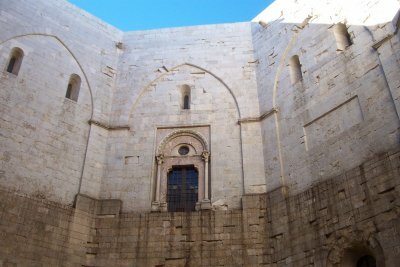 And for that the Castel del Monte still is admired, more than 750 years after its construction. My last 3 remaining WHSs in Italy were spread all over the country (Aquileia in the north-east, Barumini in Sardinia and Castel del Monte in the south) and were giving me headaches. After visiting Aquileia and upon finding out that it's only around 30 Euros each to fly from Venice Treviso to Cagliari in Sardinia and from Cagliari to Bari in the south on Ryanair, I just decided to finish them up once and for all (even though the 25 hour stay in Sardinia in winter didn't sound right). But this is about Castel del Monte outside Bari. I was supposed to have 40 min. in Bari (between my train arrival from Altamura and the bus departure to Castel) to buy the bus ticket and to find the bus . But the train from Altamura arrived 30 min. late, so I had only 10 min. in Bari. The center of Bari has 3 train stations operated by different train companies and several bus stops around them, so it was not an easy task, especially in the rain. I certainly did not have time to buy the bus ticket and hoped I could buy it on the bus, as you can do so on some buses but not on others in Italy. So I "frantically focused" on finding the bus during the 10 min. and almost miraculously found it! But when I said to the driver I wanted to go to Castel del Monte, he, who certainly didn't speak very good English, said, even though the bus was going by the Castel, it is not supposed to stop there. What!!!??? I had the screen capture of the bus timetable on my smart phone, which I showed him. He couldn't believe what he saw and called his bus company, which apparently told him his bus was not supposed to stop there, contrary to what their webpage says. I begged him to drop me off there, and then he asked me for the ticket. I said my train was late and didn't have time to buy the ticket, wherever it's sold (which kiosk???). This was the end of the story. This was the worst moment of my 20-day long trip, as the painstaking research was wasted, and now I had to take a taxi from Andria to Castel. I do think that if I had had the bus ticket to Spinazzola, the driver would have probably let me get on the bus and dropped me off at Castel. So after all I blame the late train on this incident, or I should blame myself for believing in Italian train. I was pleasantly surprised when the Castel came into my view from quite far away, as the taxi approached it. I had not realized that the Castel sat on top of a hill. I arrived there about 16:30. I was also impressed with the facade (or side view), which, perhaps due to its symmetry and color, immediately reminded me of Taj Mahal, an Islamic mosque. Later I learned that the Castel also had had some Islamic influence architecturally. After all this castle is not just another castle in Europe. It's quite unusual and imposing in an octagonal shape with an octagonal tower at each 8 corner. I walked around inside of the Castel. I thought this was definitely the worthy WHS as my last one in Italy (at least until a new one pops up). Because I was planning to take the same bus back to Bari in the morning, I had made a reservation at a B&B called "Tenuta Tannoja" near the Castel, the only available accommodation I had found online. It was about 3 km from the Castel if you take walking trails. But at about 17:30 it was dark and freezing cold outside, and I asked the staff at the Castel to call this B&B and ask if they could come to pick me up. B&B did it for free, even though the road for car was about 10 km long. Another major problem that night was that there was no restaurant or store whatsoever in the vicinity of the Castel, as the taxi driver told me as we were arriving at the Castel. So I bought some snacks at the vending machine at the Castel, but when I found out that the B&B was in fact a farm that could prepare dinner for me for 25 Euros, it was the moment for the reversal of fortune for me. When I was called in for dinner at the farm, I found a basket of bread, a plate of cold cuts, a pitcher of red wine and a large bottle of mineral water on the table and thought they were my dinner, about which I had no complaint. But then the old lady of the farm started bringing me one steaming dish after another, all in all 8 antipasto, most of which were tasty regional dishes I had never seen before. The meal, infused by the red wine, was turning into a feast that momentarily reminded me of Fellini's "Satyricon." For the main, she asked me if I wanted pasta or meat (primi or secondi) or both, and I said just pasta, as I was already pretty full by then. What she brought, pasta with turnip greens, was another regional specialty of Apulia. It was followed by a dessert, which is too difficult to describe. Without exaggeration, it was about the best Italian meal I've ever had, and I thanked the lady with "Fantastico!" In July 2015 I visited Castel del Monte, driving from the hard-to-like city of Bari. As far as anyone can tell, this castle was never used as a military stronghold. Indeed, it was never intended as such, but as a grand ‘statement piece’. Frederick II had been involved in the Crusades, and this castle was imbued with symbolism, being a blend of Classical, Islamic and contemporary European features. Why the octagons? The roof of Aachen Cathedral – where Holy Roman Emperors such as Frederick were crowned – has an octagonal roof. The Dome of the Rock – Jerusalem’s most important Muslim shrine – is also of octagonal construction. 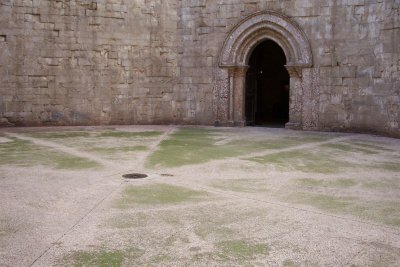 Thus, Castel del Monte was designed to embrace the octagon as a symbol of peace between the Christian and Muslim civilisations. So, a fascinating history. But I have to say that to visit the site is not such a thrill. We had to park up at the bottom of the hill and then pay a grumpy bus driver to take us up to the castle. Then it is a separate entrance fee to get inside the building, in which you can see … not very much. The castle is entirely empty, and not particularly large. It was in pretty poor nick when restoration work began, and they have certainly made it feel pristine again. Perhaps a little too pristine, judging by the bright orange of this column! But what do I know, maybe it was like that in Frederick’s time. I visited this WHS in June 2014. I ventured on an early morning drive in the Alta Murgia National Park. The drive past rolling hills with red poppies, cherry trees and olive trees was already a good start but standing alone on a promontory in the middle of the park was the Castel del Monte. There is a huge parking lot about 800 metres from it where I left my car and with the 5 euro ticket I got a return shuttle bus ride to the WHS. The castle is in a very good state and it really gleams in sunny weather. Its octagonal plan is really unique and several information boards inside the empty castle give you detailed info on the history, architecture and significance of this site. The courtyard is the main highlight inside the castle but other than that the 5 euro entrance fee doesn't offer much. The panoramic views from the castle are not to be missed and I think that opening the castle's terrace/roof in the future would make a much more interesting visit. I finished off my visit with a hearty snack near Andria - Focaccia Bread with Burratina ... bliss! Hi My name is Attilio Altavilla, brother of Enrico and Oscar Altavilla. I took my brother Oscar's advice and visited il Catel del Monte. he was absolutely correct, it is a magical place and one i will cherish for the rest of my life. I highly recommend this place to anyone who visits Italy. Bro you were right in recommending this place and i will never question your judgement again. 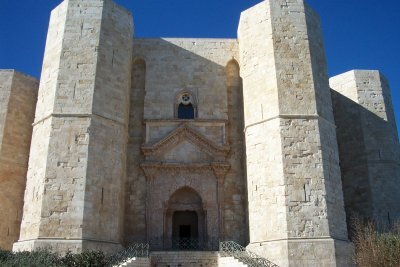 I have visited the Castel Del Monte two years ago while I was visiting family in Manfredonia. I found it to be an amazing experience. Hi my name is Oscar Altavilla and i am Enrico ALtavilla's brother. 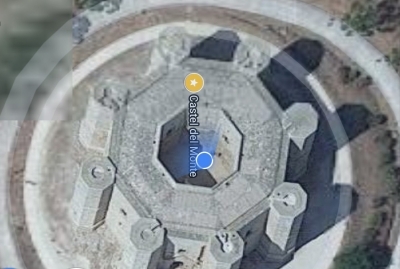 I recently went to Castel del Monte and found it very interesting.It was a wonderful experience , one that i will cherish for the rest of my life!If anyone wishes to Visit Italy i would recommend the CAstel del Monte as being their first stop! My name is Enrico Altavilla. I am a direct descendant of Frederick II, the once King of Southern Italy for whom the Castel Del Monte was built. It is said that Frederick had a good friend who was an Alchemist. When Frederick was in the process of designing the castle, he consulted with this particular friend. The layout of the castle follows some of the suggestions made. The elements, fire and water are arranged in the castle in line with these recommendations. One of the eight octagonal towers which circle the castle, was used by Frederick II as an Aviary which housed his Falcons. Frederick actually wrote at least one book on the topic of Falconry. I am proud of my ancestor for both his intellect and power when going into battle. To this day in Sicily, they celebrate the victory experienced against the invading army of Turkey which was lead by Frederick. 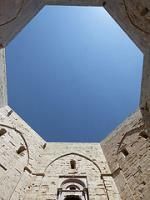 May the Castel Del Monte serve as a monument which stands for 'Mens Conscia Recti'. The Altavilla Motto which translated means, ' A Mind Conscious Of Right'. Castel del Monte is a true architectural masterpiece and one of the most famous castles in the world (it even features on the Italian 1-cent coin). Constructed by the highly educated, multilingual Emperor Frederick II, there is a definite magical atmosphere to be felt there. To be sure, the inside of the castle is slightly disappointing, since it's completely empty, but the sight of it from far away as you approach it is spectacular. It was not used for a very long time, and then only for falconry, so not much has changed since Frederick's days. The rule of the German dynasty of Hohenstaufen in southern Italy has left many traces there, especially in the form of castles in lots of cities, but none surpass Castel del Monte in sheer beauty and splendor. Mathematical Concepts: Fibonacci Sequence. "The floors, fireplaces, windows, everything seems to follow the sequence of the famous mathematician Fibonacci."